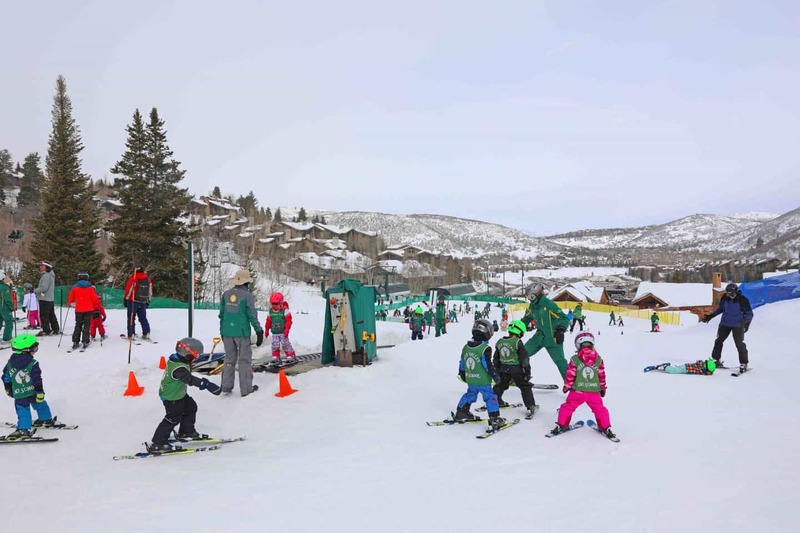 Ever since our first ski trip to Winter Park, Colorado last year was a huge hit, we decided to make skiing with kids a yearly thing. Aiden absolutely fell in love with skiing, by the end of his first day at ski school he asked me to buy him his very own skis. 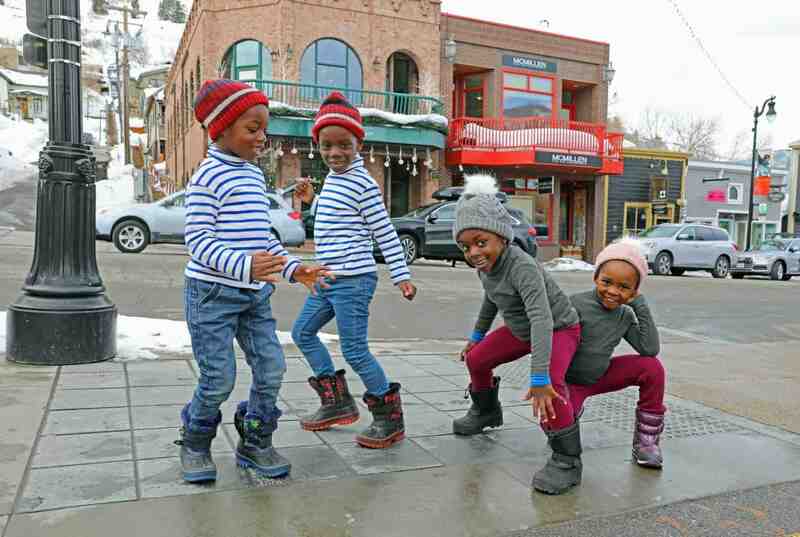 When I told the kids that we would all be going skiing this year at Deer Valley Resort, they were so excited. I was just as excited too; especially for them. 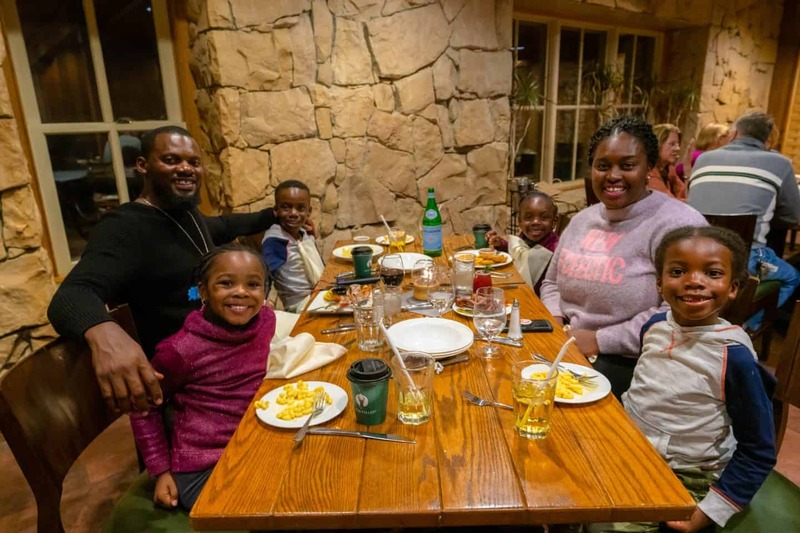 Before choosing Deer Valley Resort, I made sure to do my research on whether it would be family friendly or not and it definitely didn’t disappoint. When I am packing for a trip with all 4 kids, this is how I lay everything out so that I don’t miss anything. I pack the same amount of things for each child including underwear, socks, shoes, thermals, shirts, pants, toothbrush, etc. Laying it out like this and putting each item in the same exact place helps me not forget anything. I can gladly say I haven’t had any issues till date. 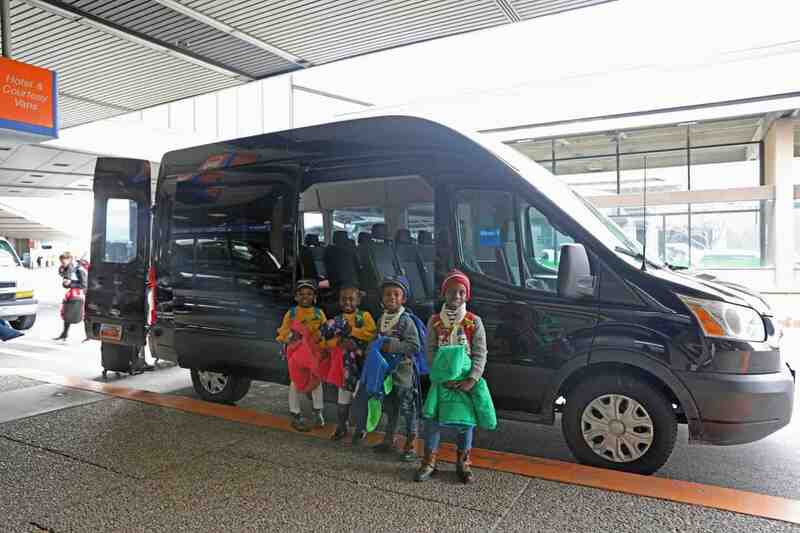 Their backpacks are on the couch with the clothes they will wear to the airport, and each kid’s backpack is aligned with their packing cube on the floor. Not pictured is their snow gear, hats, ski suit and boots which I packed in another bag. 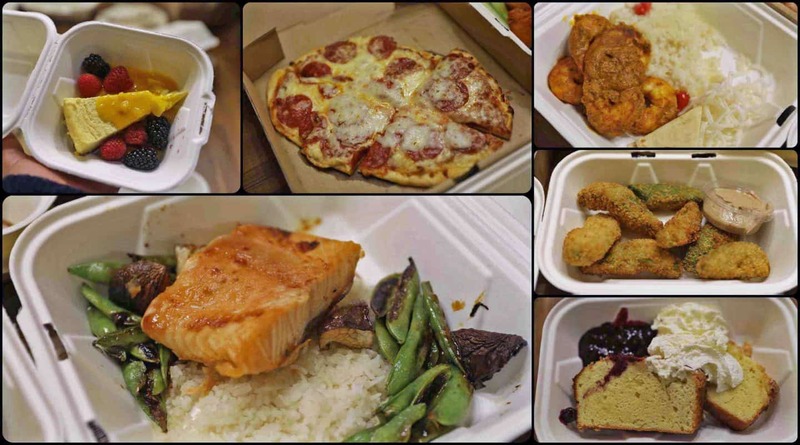 PS – make sure to pack an outfit for dinner for each night that you are at Deer Valley Resort. We enjoyed getting out of our snow clothes, taking a shower and then getting dressed and heading to dinner. Deer Valley Resort is located in Park City, Utah. 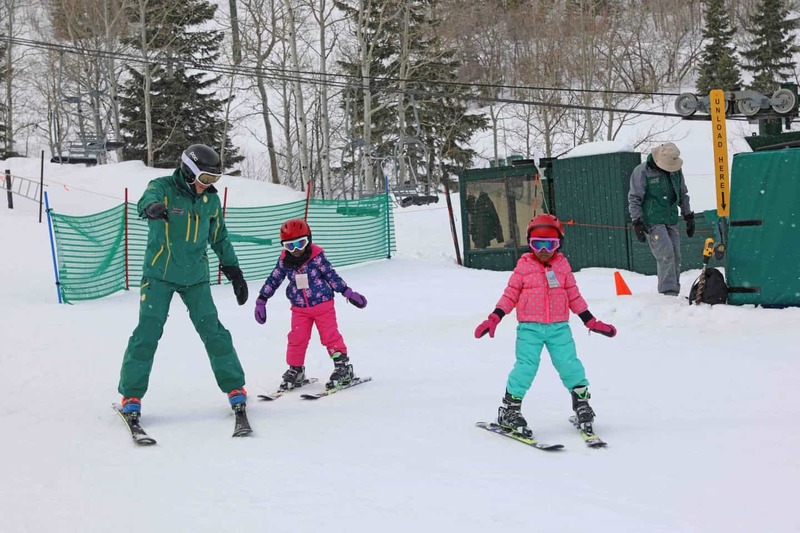 The closest airport to Deer Valley Resort is Salt Lake City International Airport (SLC) which is just a short 45-minute drive away, making it such a prime location. This means that you can fly in early in the morning and make it to the Deer Valley Resort in time to hit the slopes. 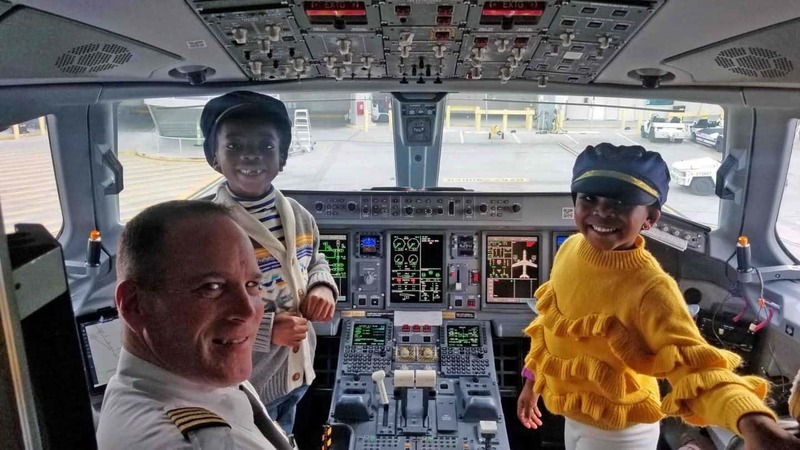 This also means that if you catch a late flight out you also have time to do things in the morning before your flight. We flew from LAX to SLC on United Airlines for $75 one way each, and flew back from SLC to LAX on Southwest Airlines for 5,063 points and $5.60 each. There are many ways to get to Deer Valley. From the airport, you can rent a car, request Uber or Lyft or pre-book airport transfer. 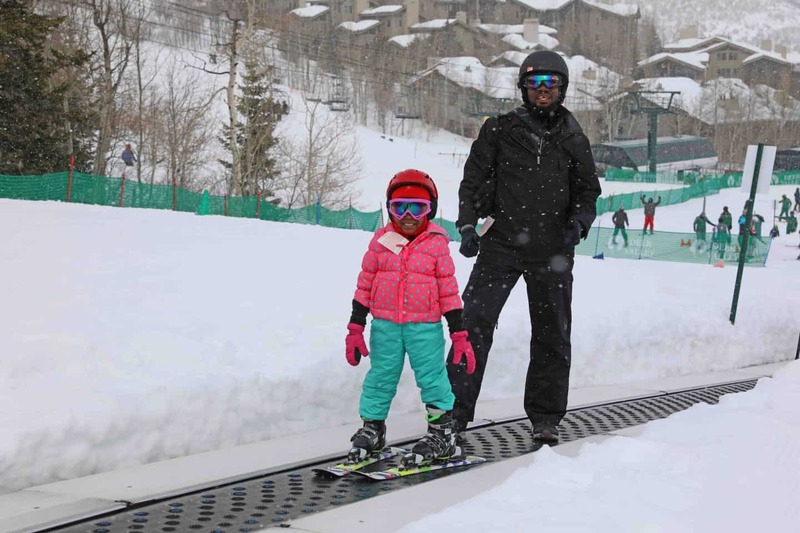 Our round-trip airport transfer from the airport to Deer Valley Resort and back were booked with Snow Country Limousine. Their service was great! Our driver was waiting at the airport with a sign with my name on it when we landed. They also provided booster seats for the kids so we didn’t need to travel with car seats. 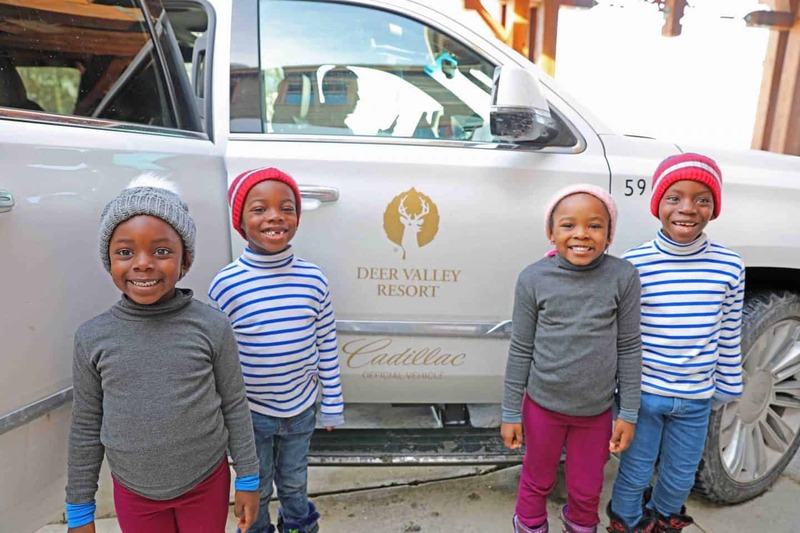 Deer Valley Resort has a complimentary shuttle as well as a complimentary car to take you around the resort as needed. 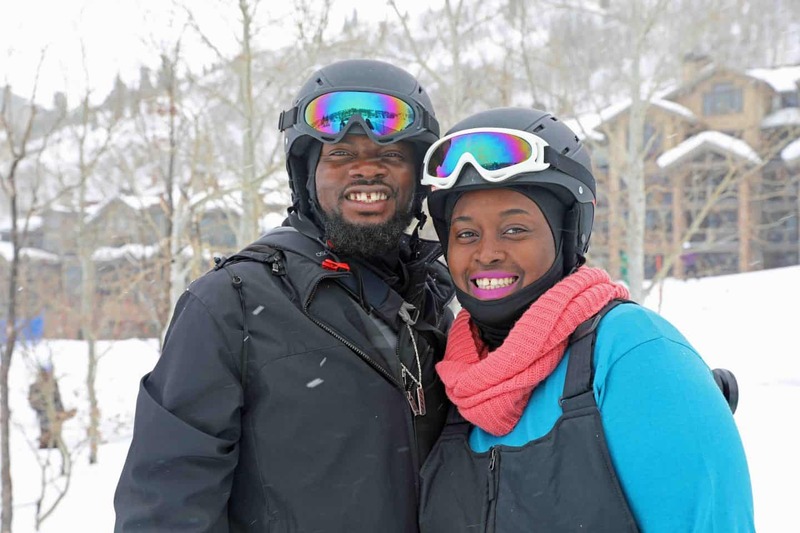 We were lucky to have those two options at your disposal to get to the slopes, restaurants and even to downtown Park City. 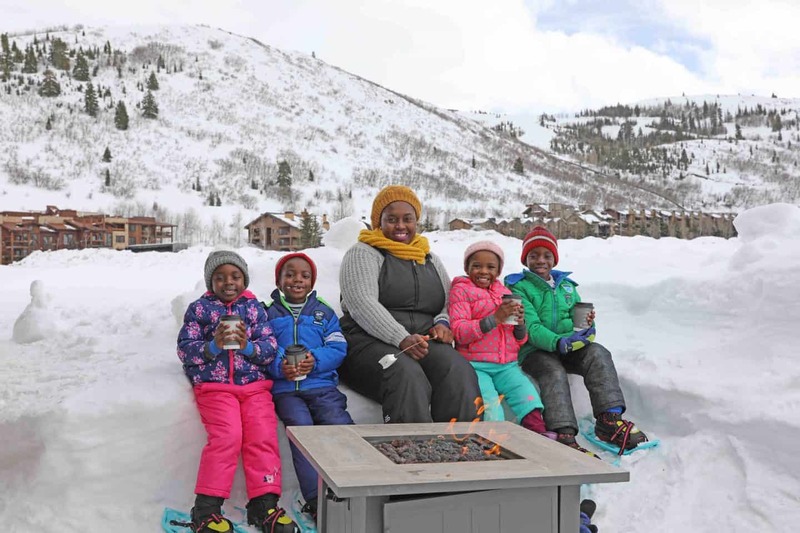 There are plenty of accommodation options for families at Deer Valley Resort. 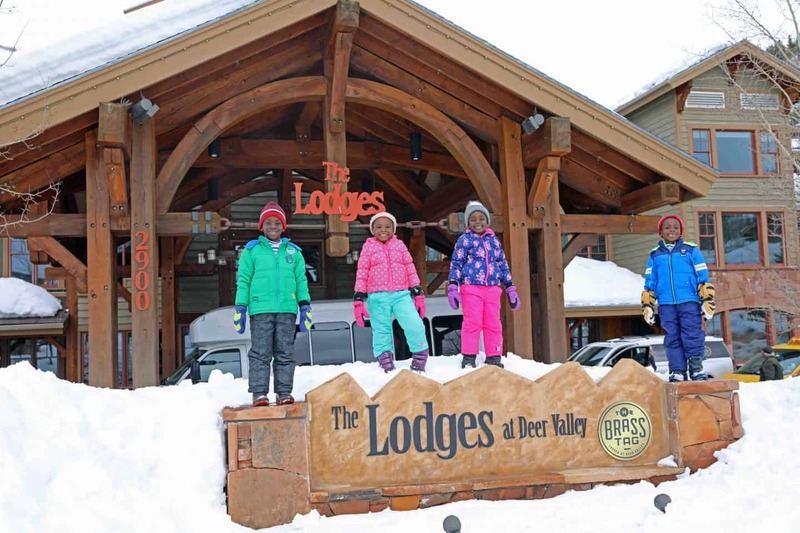 We stayed at The Lodges at Deer Valley and loved out lodge. 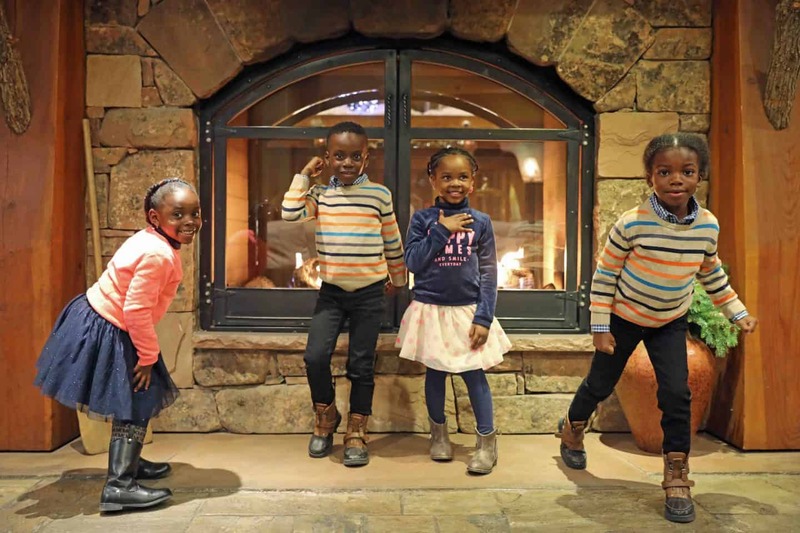 You can watch the tour of the lodge the kids of our 3-bedroom/3 -bath condo. It was big, spacious and perfect for our family, with a full kitchen, washer and dryer, fitness center, pool and jacuzzi etc. It also had amazing views of the slopes and a fireplace which made it feel so homey. Our stay at The Lodges at Deer Valley included complimentary hot breakfast which we enjoyed every morning. 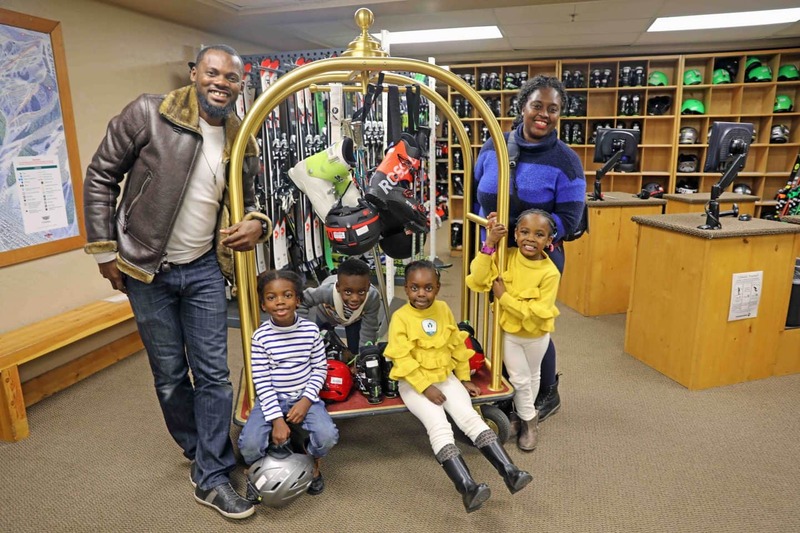 There is also a Ski Rental Shop on the first floor making it very convenient to rent and return rentals as needed and children’s activity programs. 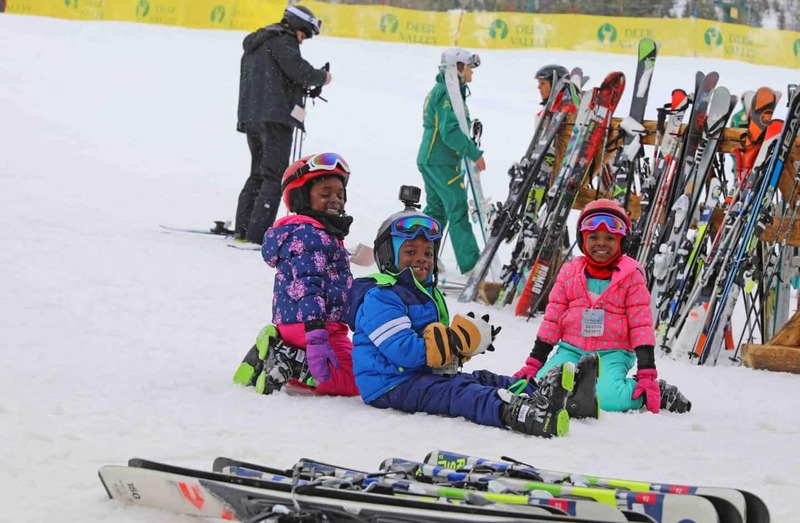 Deer Valley resort is the perfect ski resort for the newbie skier or the pro skier. There are different slopes and lifts for difference levels of skiers. If you don’t own your own ski gear, then renting it is the next best option. There are several ski rental shops where you can rent your ski gear from. We rented ours from the rental ski shop on the first floor of our hotel, The Lodges at Deer Valley. 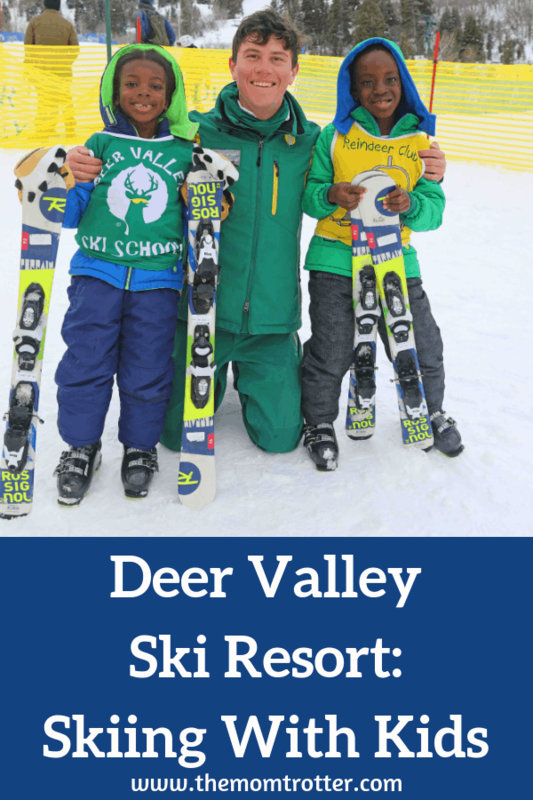 Deer Valley Resort offers ski school for kids 3 years and up as well as private ski lessons. The kids were enrolled in ski school, while my husband and I took a private ski lesson. We dropped the kids off at ski school at about 9am, but you can drop them off as early as 8am and pick them up as late as 4pm. The girls because they are younger 4 & 5 years old had half day of ski school and half day of making crafts and doing fun activities while the boys who are both 6 years old had a full day of ski school. When my husband I went to pick the up they weren’t ready to leave yet, can you imagine. 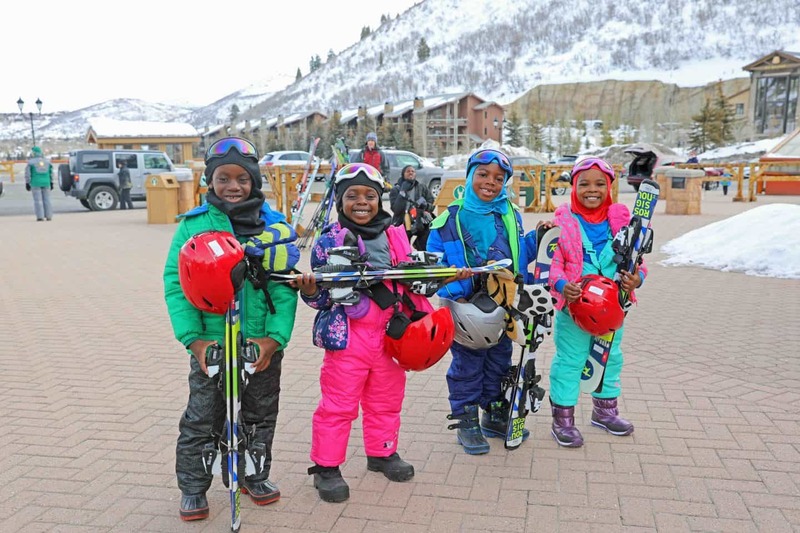 PS – the kids get snacks and lunch at ski school, healthy and nutritious options. If you have a picky eater, you can also pack a lunch for your kids. 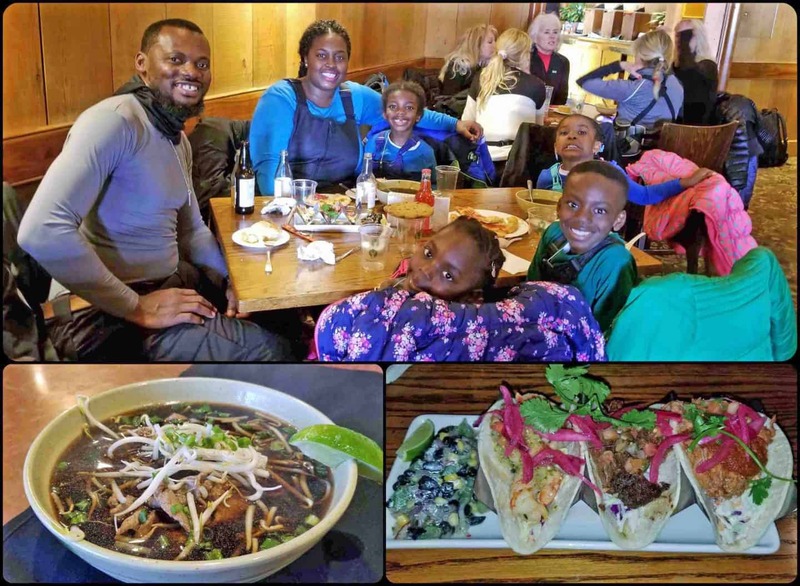 Thankfully the kids enjoyed the food, so I didn’t have to worry about that. I did check the menu prior to make sure what was offered were things they’d like. Each ski area offers complimentary overnight storage for snow boots and skis so you don’t have to lug them back to your hotel every night. 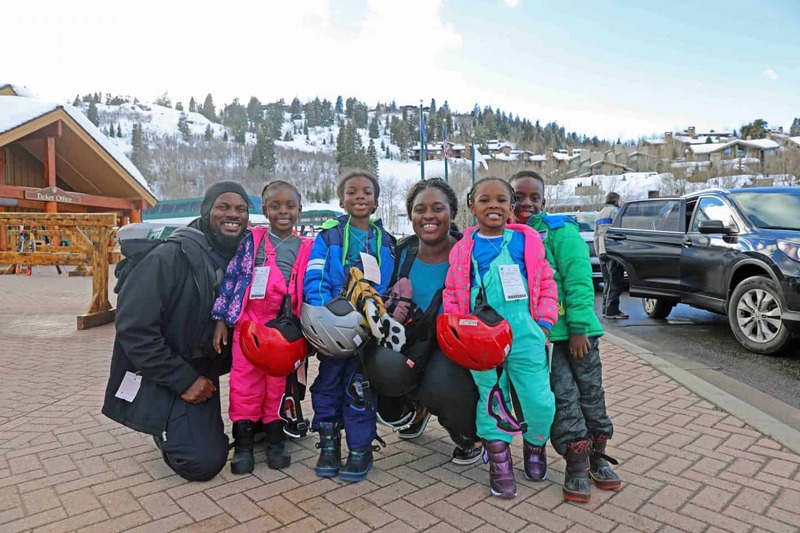 That is extremely helpful especially in our case, skiing as a family of 6 means lots of ski gear to carry around. 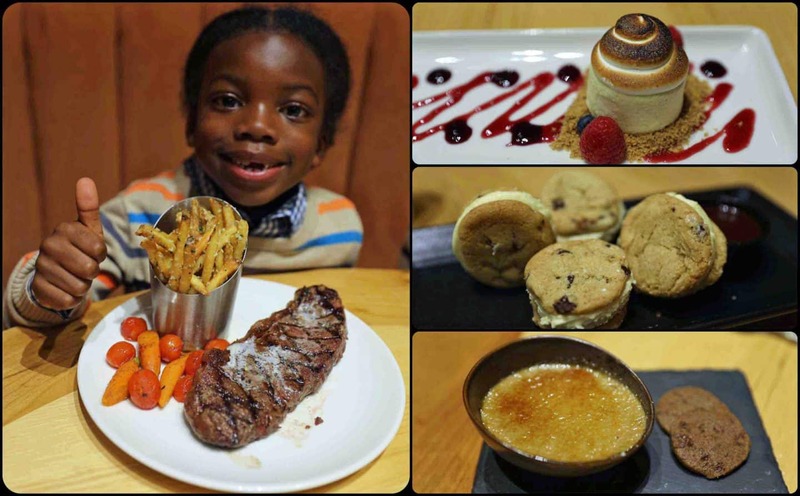 Every single meal we had at Deer Valley Resort was amazing! I am not exaggerating when I say Deer Valley Resort has some of the best restaurants I’ve eaten at. There are a variety of restaurants depending on what you’re in the mood for. You’ll never have to go off the resort for a meal unless you absolutely want to. 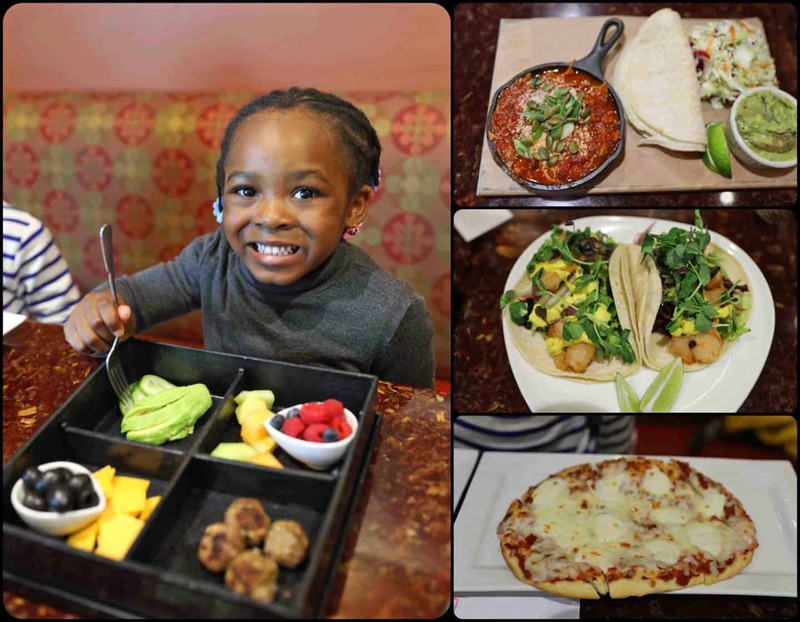 Every single one of the restaurants offered kid friendly meal options as well. 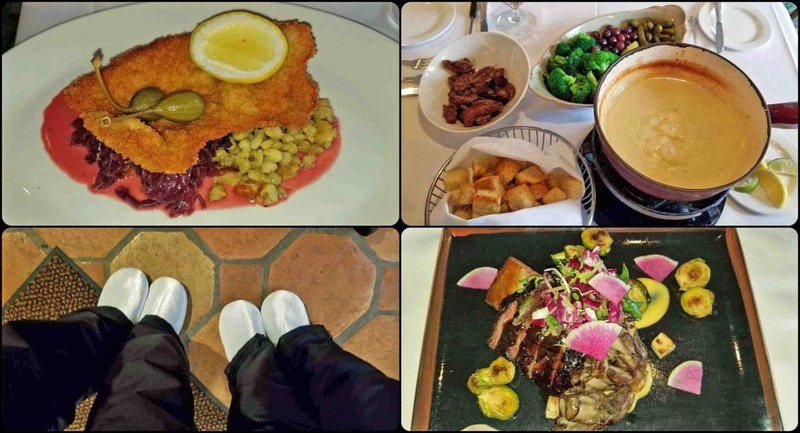 Goldener Hirsch Inn Restaurant – we took the lift to get to this restaurant for lunch. They offer slippers so that you can rest your feet while you eat. I needed it badly because my feet hurt in the snow boots. Such a relaxing atmosphere and top notch food. Snowshoeing is basically hiking in the snow with special shoes made for walking on snow. This was our first time doing this and we loved it. It was so different from anything we’ve ever done before. In the beginning it was a bit challenging to get used to walking in snowshoes, but a few minutes later the kids had figured it out. It took me a lot more than a few minutes to get used to walking in snow shoes hides face. This activity was booked through All Seasons Adventures. We had a guide who told us about the area as we walked and included smores and hot chocolate as part of our adventure. This was my the kids favorite part. Park City Museum is located in Downtown Park City. You can ride the complementary car there, and call for pick up when you are ready. 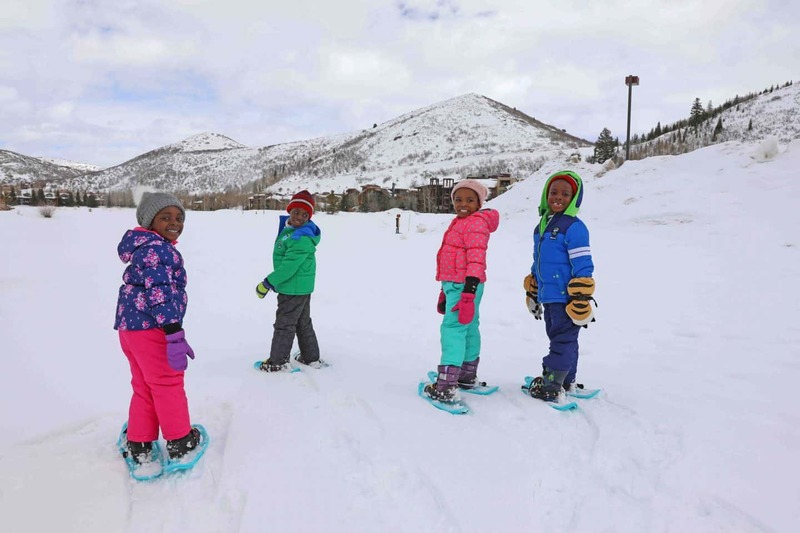 We spend some time here with the kids learning about the history of park city. 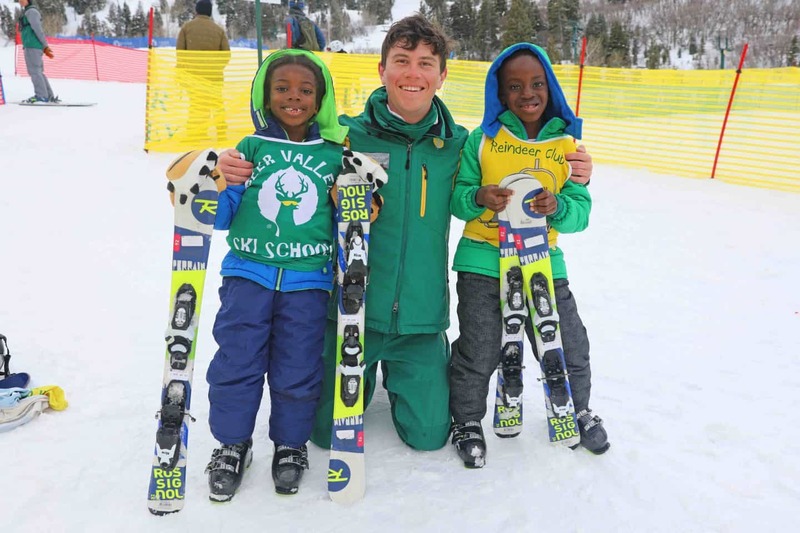 The kids loved seeing the display of old skis and how the sport came about. 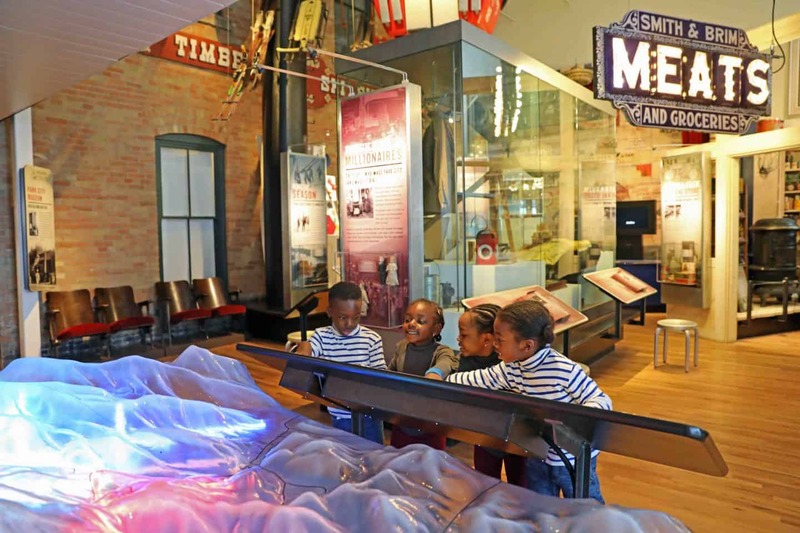 Park City has lots of amazing history that we all enjoyed learning about. Downtown park city is super cute with lots of shops and restaurants. If you have time during your trip, definitely head down there and explore. If you plan to spend most of your time at the resort, renting a car isn’t necessary. Snowboarding isn’t allowed at Deer Valley Resort. So if you want to snowboard, this isn’t the resort for you. Book your accommodation in advance as ski season is busy at Deer Valley. Certain restaurants require reservations, so make sure to book that ahead of time as well. Do note that a cancellation fee may be charged so keep that in mind when making reservations. The elevation at Deer Valley Resort may take a bit of getting used to. Drink lots and lots of water to help your body get used to it. The elevation was a bit rough for us in the beginning as we were out of breath doing basic things like walking. Can you imagine! Everyone at Deer Valley Resort is EXTREMELY nice and helpful. My husband and I commented on this on just our first day there. The level of customer service we experienced was exceptional. There was always someone willing to help the kids carry their ski gear, help with directions or anything else that we needed. 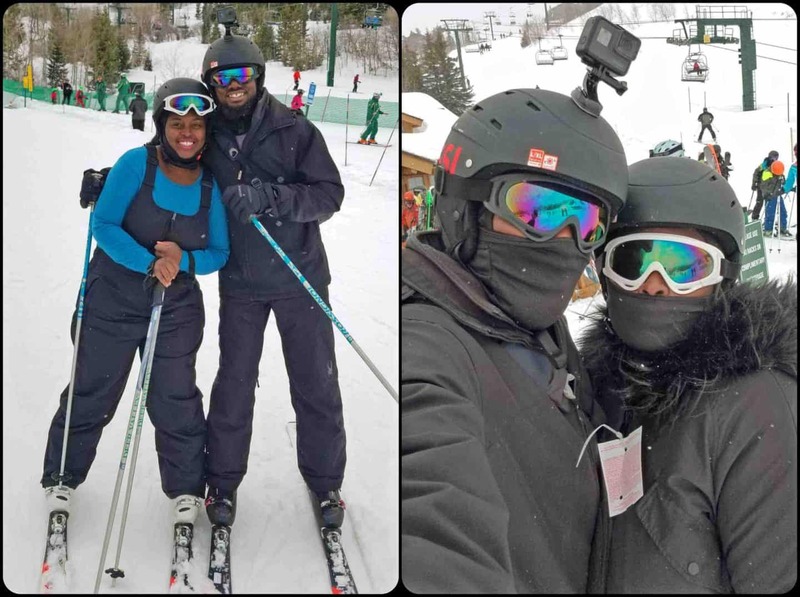 Overall our family had such an amazing and fun-filled time at Deer Valley Resort. 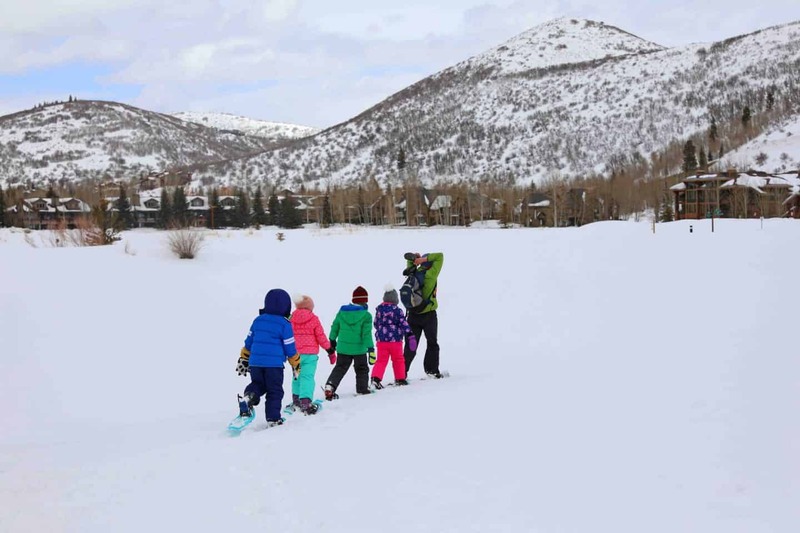 The day we were leaving the kids asked “When are we going skiing next and can we come back to Deer Valley Resort?” I highly recommend Deer Valley resort to singles, or families who want the perfect ski vacation. Our family was hosted by Deer Valley Resort, however all opinions are mine.